These are the most common sunscreens you will find in stores and probably the most convenient,see spray on and “long-lasting” sunscreens. Chemical sunscreens work by absorbing UV light often allowing the UV light to penetrate the deeper layers of your skin allowing you to tan but not burn. Chemical sunscreens usually have other ingredients to increase shelf life (parabens) or to help make the product easier to apply and these are known endocrine disruptors, like octinoxate and octisalate. Chemical sunscreens have also been a contributor to coral bleaching in the ocean which has decimated natural areas like the great barrier reef. All of that stuff we slather on our bodies is getting washed away into our Ocean and causing an imbalance in the natural ecosystem. 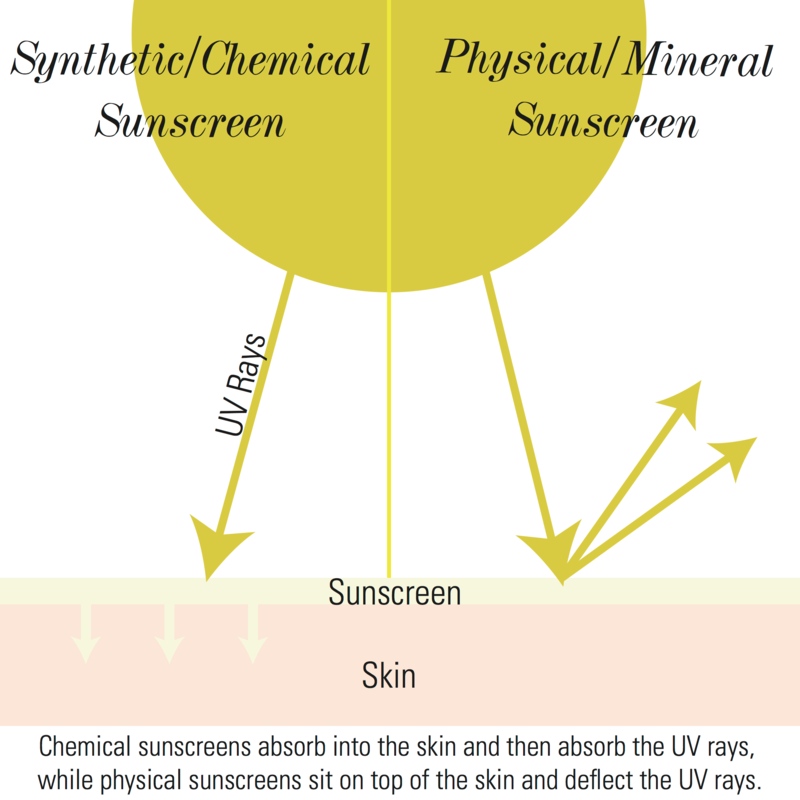 Barrier Sunscreens are mineral based and are considered non-toxic, to you AND the environment. Barrier sunscreens work by creating, well, a barrier. They block & reflect the UV light instead of absorbing it. The active ingredients in these sunscreens are the minerals zinc oxide and/or titanium dioxide. Because these sunscreens create a barrier they are often heavier and “whiter” and take a little longer to set – which is why some people don’t like the feeling of them. BUT if you’re trying to avoid one form of cancer then why use a product with ingredients linked to free radicals and cancer-causing agents as a preventative when there’s a better healthier alternative? I got you there! There’s no need to buy the most expensive sunscreen – or be brand bias (but obviously some brands are more natural/organic than others and can be “trusted”) but as a modern-day consumer, we are once again burdened with being zombies in the store aisle reading ingredients lists – that is what’s important. What is it made of and choose what fits your budget ~ or learn to make your own with a quick google search!